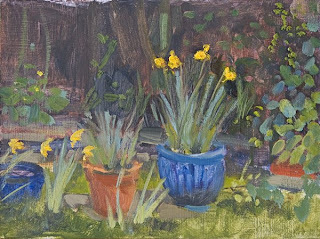 Daffodils and Pots. Oil on gessoed board. 6x8"
This painting was done very quickly one Sunday afternoon recently on a trip to visit my mum. I was keen to record the warm/ cool contrast and the way the daffodils glowed against the dark background. There were an interesting range of greens all created with a limited palette that didn't actually contain green.